After the dreamy intro where Nikki awakes and starts to piece together the recent past, the album kicks in with a march-like and anthemic Anarchy-X, a short instumental that really highlights Scott Rockenfeld's drumming and sets the eerie tone for the rest of the album. Harmony thirds played by both Chris Degarmo and Michael Wilton mixed with some awesome arpeggios by both guitar players build this song to an awesome climax. Revolution Calling is a great mid-tempo rocker and shows Nikki being swayed by this "new revolution" he keeps hearing about. Great arrangement here with some off-beat drumming that gives the song a great grove. A very abrupt ending leads into "the phone call", a very cool idea whereby the riff to the next song is heard first through the phone. 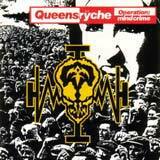 The title track, Operation Mindcrime, is about brainwashing and manipulation that ultimately leads to Nikki becoming a hitman for the new revolution. It's a slower heavier track with a great chorus. Speak, the 5th track again deals with a militant Nikki reflecting on his "new" look on society. It's one of a couple of faster tracks on the album and it cooks!! A hard driving song with great guitar hooks and a great solo. Spreading The Disease, the next track is truly one of the highlights of the album. A great dramatic opening charging into a fast paced and nastly look at corruption as it exists in every aspect of life whether it be politics or religion. This is where Nikki meets Sister Mary, a former street girl, now an agent of the revolution and the journey of heroin addiction and murder begins. The next track The Mission, is one of the best songs ever written in the power ballad genre. An acoustic guitar beginning sets the stage for a pounding gut -wrenching look at Nikki's new life as a memeber of the revolution. Geoff Tate's voice soars on this track and is truly a standout track. Suite Sister Mary is a creepy, eerie 10 minutes plus opus that is a duet between Nikki and Mary and culminates in the death of Mary as ordered by Dr. X for being a security risk. Nice guitar hooks and the use of choirs chanting in Latin (I think) gives this track a very foreboding feel. A dramatic turn of events occurs in The Needle Lies, in which the main character tries to run from the drugs and the underground world he has suddenly found himself in. This is another very fast (almost power metal like) song with excellent guitar riffs and drumming and great chorus. Three short segments Electric Requiem, Waiting For 22 and My Empty Room are dispersed amongst the three remaining major tracks (and I mean major!!). Just when you thought you'd probably heard the best parts of the album, Breaking The Silence, I Don't Believe In Love and Eyes Of A Stranger leap out at you. All three songs contain excellent guitar riffs and hooks, excellent arrangements and very memorable choruses that won't leave your mind for quite a while. The story wraps up with Nikki trying to forget about Mary but is continually haunted by her memory and climaxes with Eyes Of A Stranger whereby he realizes he was deceived and cheated by the revolution and is left to fend for himself. These last three tracks are still among the best songs Queensryche have ever written even to this day. Being a guitar player myself, I instantly found 5 or 6 guitar riffs off this album that I just had to learn to play even after very early listens. The lead solos on this album are as technical as they are stunning and Geoff Tate's vocals never sounded as passionate or better than they are on this album. We must not leave out Eddy Jackson on bass!! He provides an awesome bottom end to Scott Rockenfeld's drumming creating a very tight rhythm section that propels every song on this album. The production is perfect, the musicianship amazing and the song arrangements outstanding. There you have it! !...it is impossible to review the music on this album without explaining the story along the way as the music flawlessly moves from one track to another using voices, sound effects and other instrumental passages to tell a story, a great story with almost operatic overtones at times. This album pre-dates concept albums like Blind Guardian's Nightfall In Middle Earth by 10 years and really showed how a concept album should be done. Even after 14 years of owning this album, I can still say after many years of bombarding my ears with all sorts of metal music, this album is still one of the best metal albums ever made hands down. This album captivates you, takes you on a whirlwind musical journey and you find yourself not being able to put it away for quite a while.. This album should be on the "Required Listening List" for any fans of bands such as Dream Theater, Edguy, Nevermore and many other bands in the melodic metal and progressive metal genre. This album is a classic in every sense of the word and if you have never heard it, buy it immediately and enjoy the ride!! !